The Gulfstream IV, an improvement of the Gulfstream III, features drastically lower noise emission and fuel burn than the II and III's. Additionally, the G-IV features a longer range than the G-II or III while sporting one of the longest cabin lengths in the class, lavishly seating up to 14 passengers. 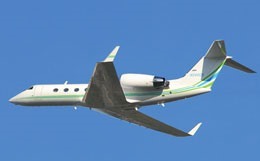 Gulfstream introduced the Gulfstream GIV as the fourth installment in the Gulfstream family line. The design phase for the GIV began in 1983, and the model made its first flight on September 19, 1985. The Federal Aviation Administration (FAA) awarded certification for the GIV on April 22, 1987. This model features several notable upgrades, the most prominent being upgraded Rolls Royce engines. 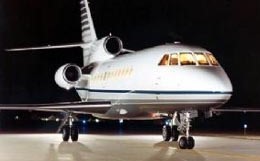 The Gulfstream GIV served as a mid size intercontinental range business jet and was used as a base for future Gulfstream aircraft. 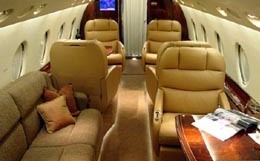 Amenities included in this private business jet are a large galley and a full lavatory with a built in shower. Production on the Gulfstream GIV started in 1986 and ended in 1993. 200 aircraft have been built so far. The cabin of the Gulfstream GIV measures 45.1 feet in length, reaches 6.1 feet in height, and stretches a maximum of 7.3 feet in width with a floor width of 5.5 feet. The GIV is set up to require two crew members in the flight deck and accommodate fourteen to nineteen passengers. There are several different cabin configurations available for this private business jet, from executive layouts to configurations allowing for sleeping arrangements. Twelve Gulfstream windows surround the cabin, providing ample natural lighting perfect for working on a project or enjoying your flight. With a maximum cabin differential of 9.5 psi, the Gulfstream GIV is capable of maintaining a sea level cabin altitude at an altitude of 22,000 feet. The Gulfstream GIV comes equipped with two Rolls Royce Mk 611-8 engines. These powerful engines are rated at 13,850 pounds of thrust and provide this aircraft with the improved performance and comfort features of 15% improved fuel consumption and decreased noise levels. The Gulfstream GIV features a climb rate of 4,000 feet per minute and is capable of climbing to an altitude of 37,000 feet in just seventeen minutes. The Gulfstream GIV requires 5,280 feet of runway to take off on a standard day. At an airport with an elevation of 5,000 feet, this take off requirement increases to 7,300 feet of runway. With four passengers on board, this private business jet needs only 3,361 feet of runway to land. The maximum range of the Gulfstream GIV reaches 4,220 nautical miles and features a maximum certificated service ceiling of 45,000 feet. In a long range cruise configuration, the GIV is capable of maintaining an airspeed of 459 knots at an altitude of 45,000 feet. In a high speed cruise configuration, the GIV is capable of maintaining an airspeed of 480 knots at an altitude of 41,000 feet. 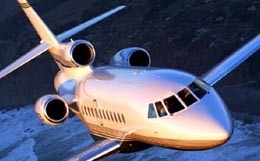 The Gulfstream GIV comes standard with the Honeywell SPZ-8000 integrated digital flight guidance system avionics suite. This system utilizes an Electronic Flight Information System (EFIS), which features six displays for pertinent flight information. Avionics systems incorporated in this suite include a Flight Management System, dual Collins communication and navigation radios, and dual Honeywell laser inertial reference systems (IRSs). Additional instrumentation options include an air to ground telephone, triple laser inertial navigation system (INS), and dual FMS. For more information about chartering, leasing or buying a Gulfstream GIV please contact us by calling +44-20-3874-8091 or send us an email here.